Boston Scientific and Medtronic are among the orthopedic device makers gaining value in Tuesday's session. NATICK, Mass. ( TheStreet) -- Boston Scientific ( BSX - Get Report), Medtronic ( MDT - Get Report) and Stryker ( SYK - Get Report) were among the orthopedic device makers whose shares were rising in Tuesday's trading. "Boston Scientific's doing well with the overall market today," RBC Capital Markets analyst Glenn Novarro told TheStreet, commenting that it was a good day for the sector so far. While the overall market wavered on U.S. deficit-reduction negotiations and eurozone efforts to limit debt contagion, medical device makers were mostly in positive territory. Shares of Baxter International ( BAX - Get Report), Covidien ( COV, Stryker ( SYK - Get Report), Medtronic ( MDT - Get Report) and Zimmer Holdings ( ZMH were all higher in morning trading. Johnson & Johnson ( JNJ - Get Report) were lower much of the morning but pushing into positive territory ahead of midday. Novarro said the group's upward trend Tuesday could simply be the result of portfolio managers rotating into safety and starting new positions as the third quarter gets under way, and healthcare stocks are generally perceived to be safer. 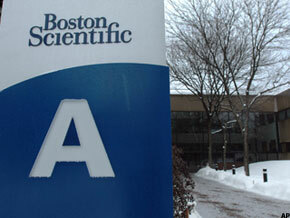 For Boston Scientific, despite Tuesday's gain the stock remains around 5% lower than in early May when it announced the unexpected retirement of CEO Ray Elliott. Investors wondered why Elliot, who was brought in two years ago as a turnaround expert and cost-cutter, would retire "right in the middle innings of the turnaround," Novarro explained. Elliot has said that the turnaround is ahead of schedule, making it appropriate for his exit at the end of the year. "Many don't believe him," Novarro said. "I do but I'm in the minority," while others wonder if the turnaround could fail or if other problems lurk. "There are no concrete answers." -- Written by Miriam Marcus Reimer in New York. >To contact the writer of this article, click here: Miriam Reimer. >To follow the writer on Twitter, go to http://twitter.com/miriamsmarket. >>See our new stock quote page.